In the midst of an era, whose effective internal value systems are only pursued to the point where they cease to be commercial viable, we find it increasingly more difficult to orientate ourselves, and to find simple guiding principles for engaging with the world around us. This post-industrial and pervasively digital age is one characterized by the simultaneous incidence of each and every signifier at once. All existing values and cultural templates are thus, as a result of their omnipresence, pitted against each other in a permanent battle for media supremacy. In light of this dilemma, it makes sense to take what may seem a romantic step backwards, in order to find a truly relevant value system - one that proves resistant in the face of the present circumstances. In other words, a common denominator, operating in a space outside of and beyond the prevailing economic-cultural battle for dominance. It is perhaps in the field of tension that exists between feeling, love and heightened emotion, where we find our last illustrious place of refuge, a space for mindfulness and for focusing on those most vital aspects - or lifeblood - of the human condition. As such, one turns to the most intense spectrum of human emotions - and in turn, the associated feelings of impending failure, sudden finality and the intrinsic and everlasting pursuit of a new sense of love - as the last glimmer of hope against the technical assimilation of the modern world. The mirror of emotional experience heightens the concentration of the observational perspective, while also allowing for a much-needed sense of distance from the unfeeling apathy of the modern media landscape. Faith in an infallible ideal and the simultaneous fear of loss, open up the breadth of tension and feeling inherent in life itself, to observation from the outside. In terms of parallels, one inevitably turns to our reception of contemporary art which also establishes an essential distance to the world and thereby proves particularly emphatic in its portrayal of living reality, particularly in terms of the fragility and manipulation of the landscape of human emotion. As such, the contemporary artist is in a position to develop a relevant visual grammar which, in conveying to the observer an intense visual experience, can reflect the problematic relationships at play in purely aesthetic terms. The artists featured in this exhibition are capable of filtering our reality of its tired marketing strategies and affirmative-image offensives, establishing in their place a system of images which serves not only to capture the ambivalence of life but, in their deeper analyses, an emotional field of tension - all by means of their aesthetic characteristics and visual metaphors. 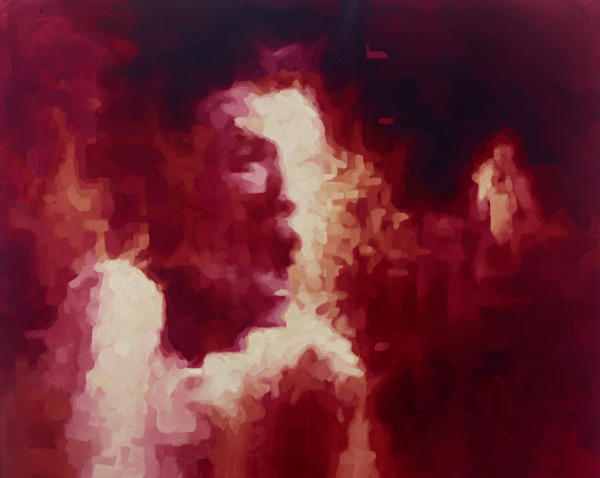 The Viennese painter Adam Bota, for example, delivers images of dissolution, whereby the dullness of his oils, the pictorial blurring and the reduction of colour in favour of a calculated sense of ecstasy, point to the elusiveness of the human psyche. The reduction in Bota's work equates to a form of densification which offers only one escape route: the path that leads back inwards towards itself. Anne Wölk, on the other hand, encages and confines the scenes she paints, reminiscent of Max Beckmann's work before her. The viewer's access to her figures is superimposed from outside - ornaments and geometric figures take on their own lives, then diagonal lines trap the observer's gaze in the depths of the image. The interdependent abstract and concrete pictorial elements reside in a highly emotionally-charged atmosphere, from which the viewer's eye finds it difficult to escape. In Adam Magyar's featured video work, commuters at Berlin's Alexanderplatz underground station are captured in a moment of insistent physical progress but seem, upon the arrival of the Berlin U-Bahn, somehow rigid at the same time. The figures are filmed from within the moving train using a slow-motion scanning technique developed by the artist himself. This provides a level of clarity that far exceeds that of normal, everyday perception and the images are at the same time encircled by vibrating, suggestive sound. The individual is hereby once more an individual: he or she emerges, unique, from the surrounding mass. What should be invisible moments of feeling in the faces of these figures, now resonate clearly, allowing the city commuters to protrude from the crowd in a way that goes beyond mere physicality and enters the realm of emotionality. The viewer confronted with this image is sucked into what seems to be a moment of complete urban silence. Just as frozen in the moment are the figures in the work of Gábor A. Nagy. They seem to hang and waft over a black background which perhaps stands as a representation of a realm of nothingness. With his monochrome black, Nagy serves, in his own way, to preempt what we might refer to as "the End", creating cipher-like textual mosaics. With the work acting as a type of black Tabula Rasa, we are absorbed slowly but irreversibly into the image by motifs that become increasingly clear in view of our inner eye, programming us with their logic. This fragile pictorial situation is a sensory stimulus that prepares us for an ending, and while that end may only be metaphorical, the sensory resonance of these images lies in the fact that the only refuge we are afforded from their iridescent haziness is the path that leads to a dark nothingness. The text fragments Nagy uses originate in part from British independent music lyrics and portray (as is the case with the image “Love Will Destroy Us In The End” shown here) a longing for happiness and love in our cultural present. Feeling is given concrete form in both formal aesthetic and textual terms, albeit in a distant, dark universe. All these artists achieve a heightened densification and compression in their works, thereby delivering an insistent aesthetic charged in the most diverse ways with a spectrum of emotions. Using carefully calculated visual concepts, they address the themes of dissolution, stagnation, retreat, separation and isolation while pointing to a contemplative utopia only now possible within the sequestered realm of the art space. Thus the works present an answer to the banal mélange of the image-saturated, affirmative-media landscape we are surrounded by. As alluded to by the title of the exhibition, this is a group of artists that seeks to expose the ambivalence of contemporary life to an extreme tension, while not shying away from - and here we need only look at the cover of this catalogue - potential self-destruction as a visual theme.